The identity and access management challenges that exist in the physical world - identity management, application security, access control, managing sensitive data, user activity logging, and compliance reporting - are even more critical in the virtual environments that are growing in use as IT seeks to streamline its operations and reduce operating costs. However, security risks are increased due to the nature of the virtualization environment and IT should seek to extend their security solutions from the physical server environment to the virtualization environment as seamlessly as possible. 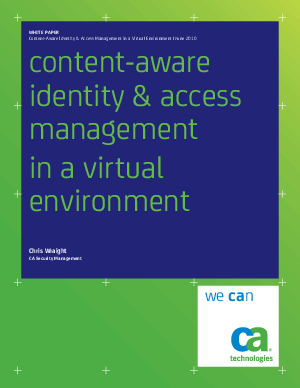 Continue reading this white paper to learn how CA Content-Aware IAM solutions help protect customers in the physical world and similarly protect virtual environments by controlling identities, access, and information usage.